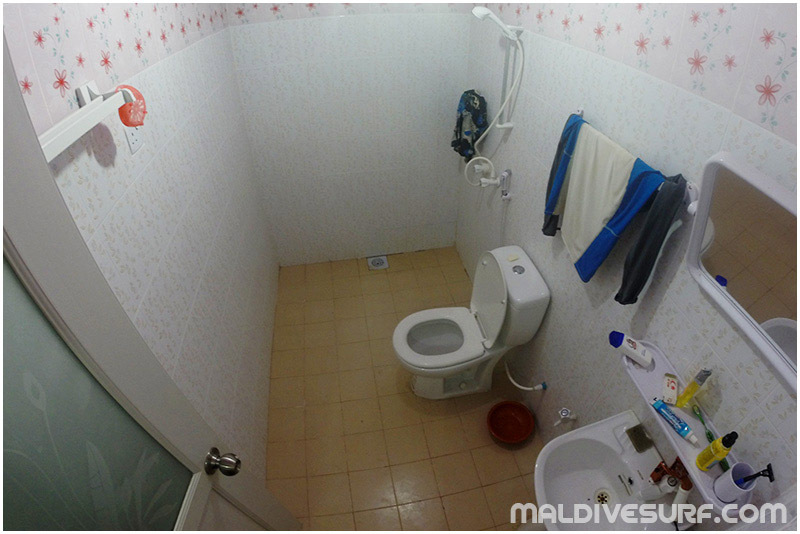 Since Thulusdhoo (Cokes) opened its doors in 2010, guesthouses have been booming in Maldives. For single travelers, backpackers or small groups. If the location is right facing the waves, then you may go surfing whenever you want (attention, some spots may require an extra boat transfer). 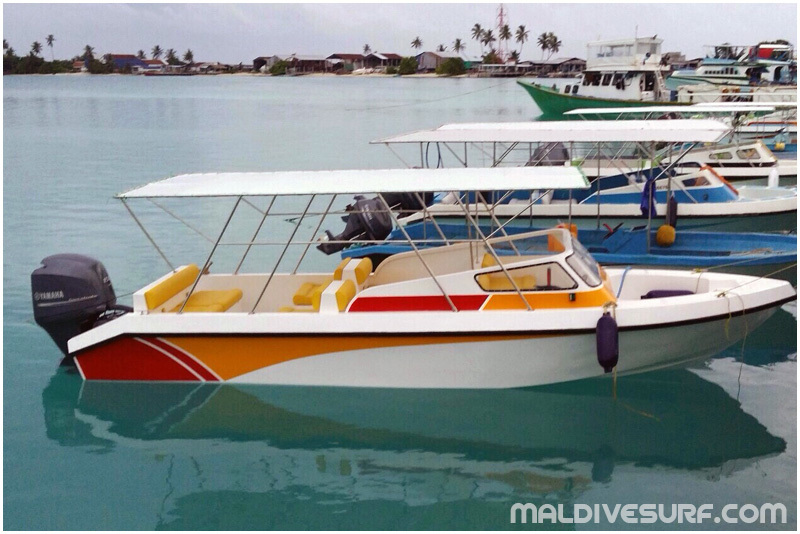 Keep in mind that airport transfers can be cosltly as well as domestic flights for remote atolls. Note : beers and alcohols are prohibited in local islands. Some restrictions may apply for female swimsuits / bikinis. 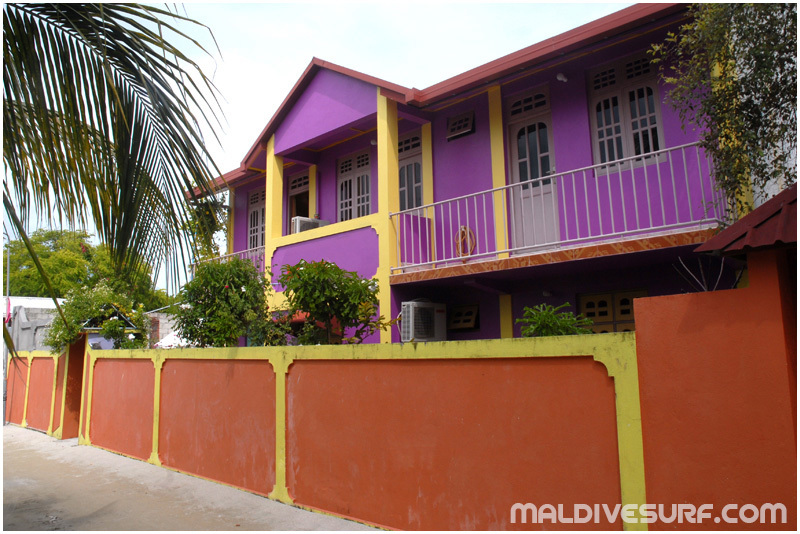 It's now possible to stay in a guest-house in Thimarafushi 5-10 minutes from Mikado. 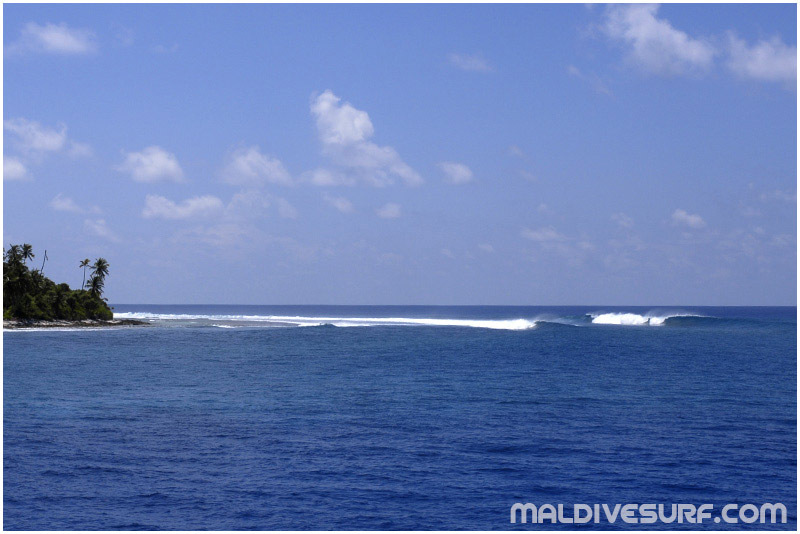 Within 5 min walk from the guesthouse, you can check swell and swell from Thimarafushi reef corner (not really ridable). Thimarafushi harbor stays 5min drive from the guesthouse. 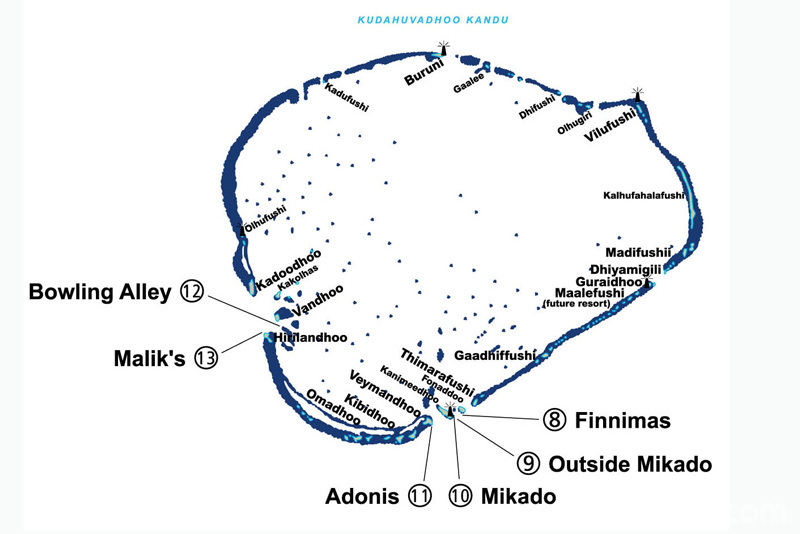 The speedboat can access 5 spots within 5-10 minutes (depending on sea conditions), 2 spots being consistent (Mikado Rights, Finnimas Lefts). Finnimas Rights : occasionnal rights with W-SW winds and decent size swell. Wedging peaks with hollow sections and weak walls. Very rarely surfed. 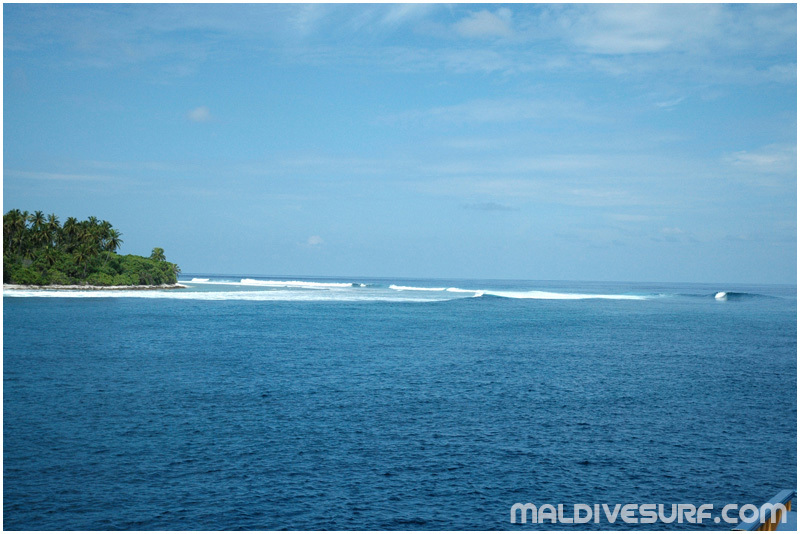 Visible from Thimarafushi reef corner. Finnimas Lefts : very consistent lefts, catching any swell from SW to SSE. Best with NW-N-NE winds. Peaky sections then fast wall zipping througfh the inside reef. Can be ridden any size, even small, like a beachbreak with lefts and rights. Best high tide but ridable any tide. Hard to shoot since land access is denied (former fish factory which is now closed). Outside Mikado : rare shallow rights. Best with N-NW winds. Safest at high tide. technical treacherous sections with fast walls on shallow reef. Rarely surfed. 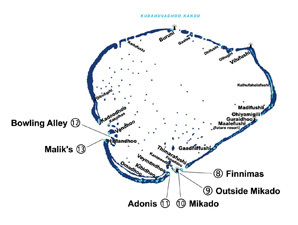 Inside Mikado : the Pearl of Thaa atoll. Short right but perfectly shaped which ends in deep water. 120° amazing refraction from the maon S-SW swell direction. Hollow sections, some tubes, easy but shallow. Best with S-SW-W winds. Ridable all tides but better mid-to-high. Very well sheltered from strong monsoon winds by Kanimeedho garden island. Paradise beach facing the spot : djolis (hanged chairs); benches, cement jetty, coconuts, rabbits... even a high tide beginner spot ! Other names : Farms, Little heaven, Aquarium ! 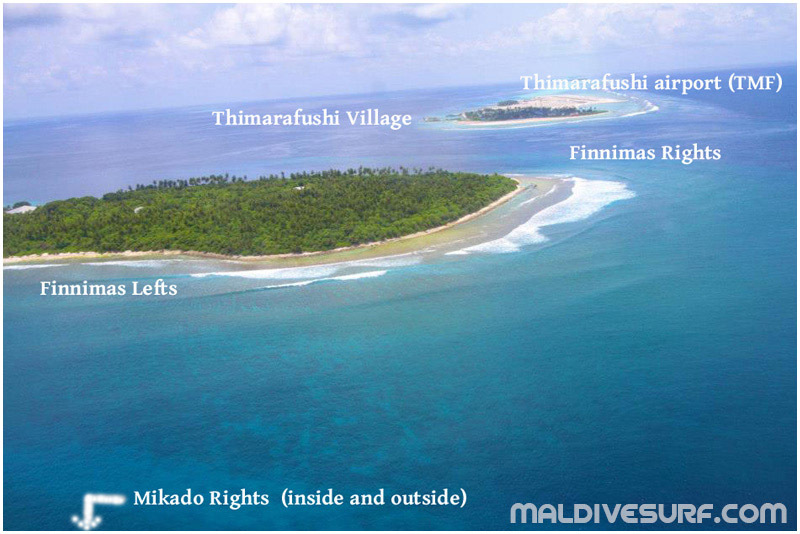 Adonis : very occasionnal rights on Veymandhoo island reef. A section can be caught. Usually noone out. 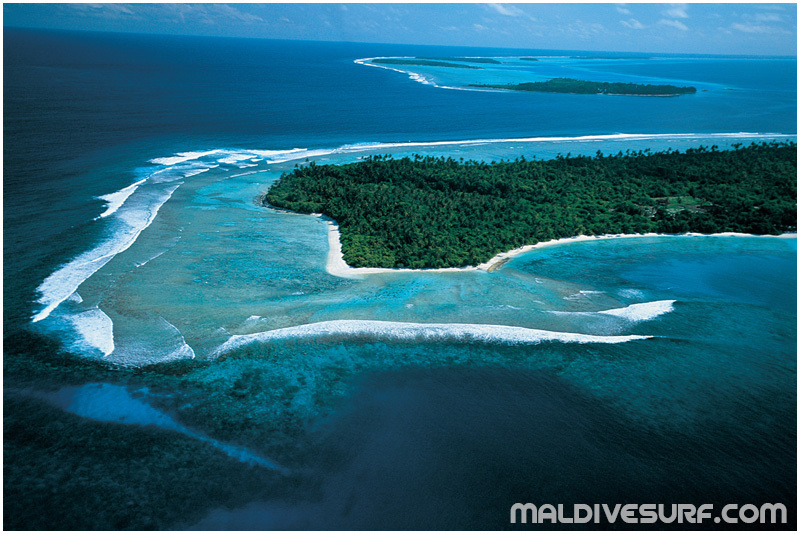 Hirilandhoo : 2h by dhoni or 30min by speedboat. Lefts in the western pass are best with SE winds (rare, summer) or no winds. Maliks offer a very long sectionny left, can be ridden from 2 to 6ft. Bowling Alley is a reef with rare lefts and rights peaks inside the pass while Kakolhas iland can produce amazing lefts. 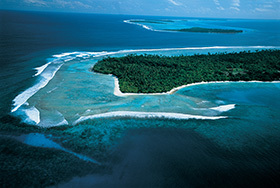 Laamu atoll is 4h cruise south, too far to reach. It may block / filter some SE swells (rare, usually S). Mikado Guesthouse just opened its doors, some minor works still to be done (external shower, board rack). 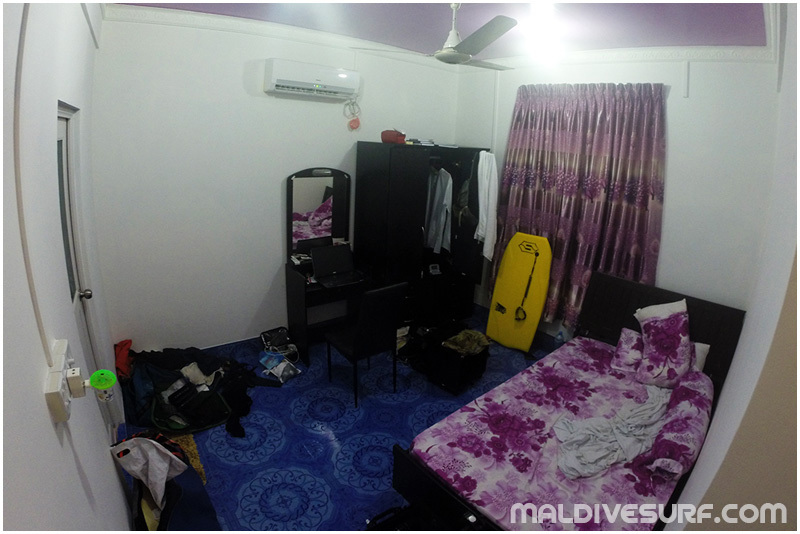 6 rooms with individual aircon available in 2015. 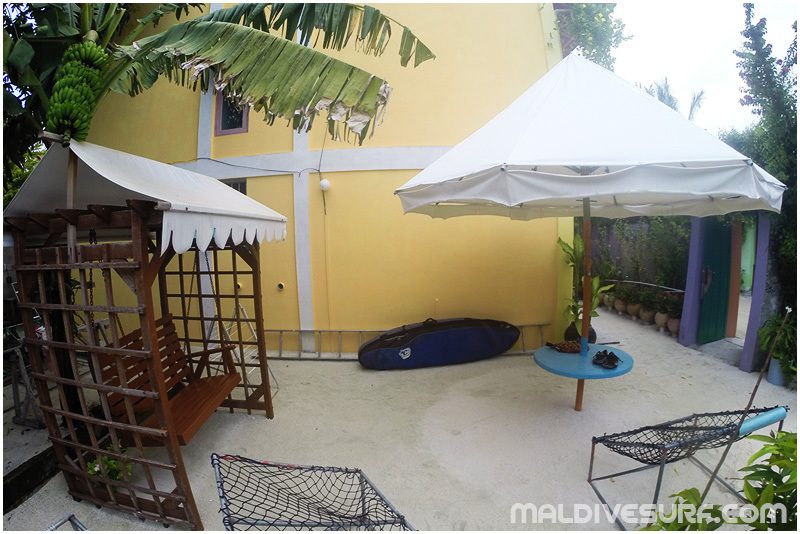 The guesthouse offers a nice garden area to leave boardbags and spend some time outside. Beds are king size or twin beds. You also have access to a kitchen with a fridge for breakfast and special stuff. Free 3G WIFI. For meals, 2 restaurants are fully opened. Adam's Café (harbor side, 5min walk) and the Beach Restaurant (Reef side, 10min walk) offer various dishes. Better ask "No Chillies" to avoid spicy food. Hard to spend more than 5-7usd for a full meal. No alcohols available (the only way to drink is to go and see "safari boats" while at anchor in Mikado or near airport. Several small shops, including one facing the guest-house : bananas, mineral water, biscuits, soft drinks...). 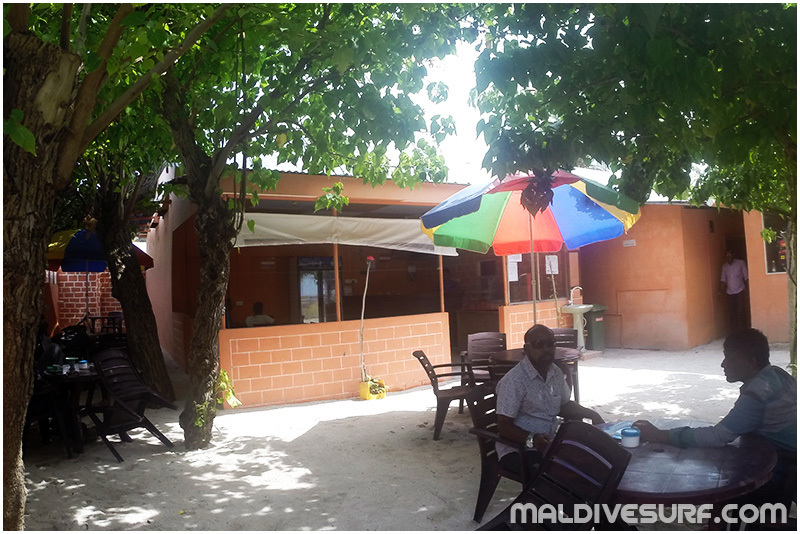 The reality is that you tend to spend much time by Mikado beach, facing the surf, which offers a fantastic picnic area with a friendly island keeper always willing to help : benches, chairs, tables, bbq stuff; shade, fruits, pontoon for fishing, Maldives Class snorkeling spot. Walk around the island by the beach in 1h ! 20ft long, 150 Hp engine, 10 sheltered seats. 2 return trip surf transfers per day included. 400 usd return. 2 flights per day. Generally speaking, 1 flight morning, 1 flight late afternoon. - Airport pickup byVan : 12$ US A/R per pers.